The GS12070 is a four-input and four-output device which supports conversions between multi-link, dual-link and single-link UHD-SDI interfaces. A bypass mode is also available where the inputs can be routed directly to the outputs. The device supports 12Gb/s, 6Gb/s, 3Gb/s and 1.5Gb/s data rates in the conversion modes and additionally supports 270Mb/s in Bypass Mode. 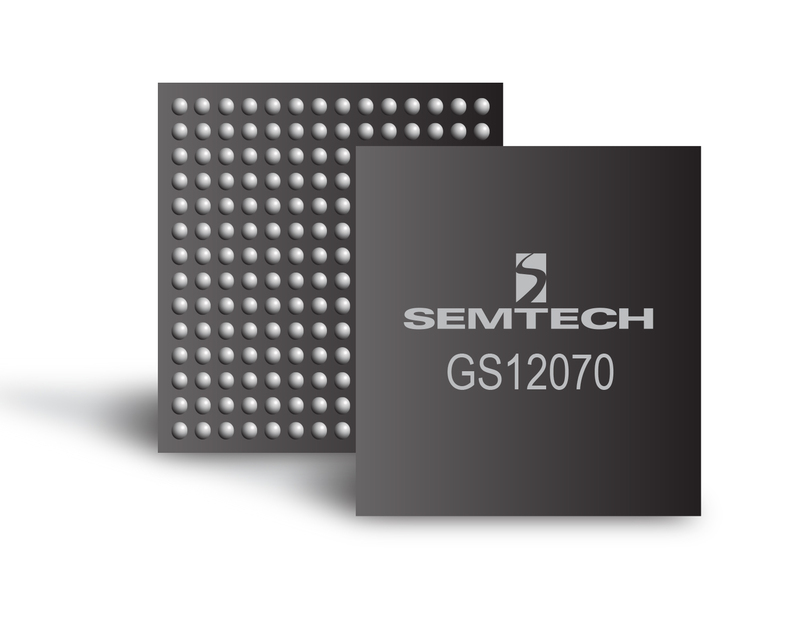 The GS12070’s features 100 ohm differential serial interfaces, allowing connection to Semtech equalizers, cable drivers as well as optical modules. The GS12070 supports both multiplex and de-multiplex modes in one device. The desired mode and conversion is set through mode-select pins. The GS12070 eases the system challenge of receiving multi-link SDI signals by automatically compensating for input channel skew. In modes that convert from 12Gb/s ßà 6Gb/s combinations, the GS12070 automatically compensates for up to 300ns of serial input channel skew. In all other conversion modes, up to 800ns of input channel skew is available. As link ordering is critical for multi-link interfaces. The GS12070 is able to automatically order the incoming serial streams for multiplexing SMPTE compliant UHD-SDI interfaces. The link order can also be configured manually to compensate for cases where the cable order has been connected incorrectly. In configuration modes where there are unused outputs available, the GS12070 can be programmed to duplicate existing outputs. In addition, inputs can be assigned to unused outputs for monitoring purposes.